Around 7.2 tonnes of elephant tusks with an estimated value of £7m were hidden in cartons labelled frozen fish in a container shipment. There is still a market for ivory and as long as there is there will be those willing to enter the high risk business to satisfy it. 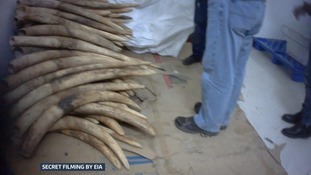 Shui Dong is the size of Brighton, but it is the destination for 80% of all poached ivory from Africa arriving in China. Conservationists are calling the ban significant because the country's consumer market drives much of the elephant poaching across Africa. A proposal to sell ivory stockpiles and return profits to communities that sustain elephants has been defeated at a major global conference. Prince William said at current illegal poaching rates when Princess Charlotte turns 25, the African elephant "will be gone from the wild".